THE young centrist’s comments came as European leaders agreed a Brexit divorce deal at a Brussels summit on Sunday, during which they stressed the UK would remain a friend and ally. Asked whether there were parallels between the Leave vote and the violent anti-government movement currently gripping France, Mr Macron said the two situations could not be compared. “I don’t think the situation of all our countries can be compared. Brexit said a lot about the divisions and the very different positions between those living in the City [of London] and the rest of the United Kingdom, between the young and old,” he said. “What that shows is that in all our democracies, it is clear that our duty is to give our popular and middle classes more prospects as well as the capacity to build progress,” he told reporters on the sidelines of a Brussels summit during which European leaders officially endorsed the terms of Britain’s withdrawal from the bloc. “There are those who succeed in this globalised world, and those for whom progress is no longer accessible,” Mr Macron continued. France’ grassroots protest movement began as a fuel tax revolt but has since turned into a more general movement against Mr Macron’s “unfair” economic reforms. Earlier on Sunday, Mr Macron also stressed that Britain's Brexit vote showed that the European Union urgently needed reform. The loss of faith in the European project and its leaders has become increasingly widespread, boosting the visibility of anti-EU leaders who have promised to unite against the bloc’s progressives in next May’s European Parliament elections. 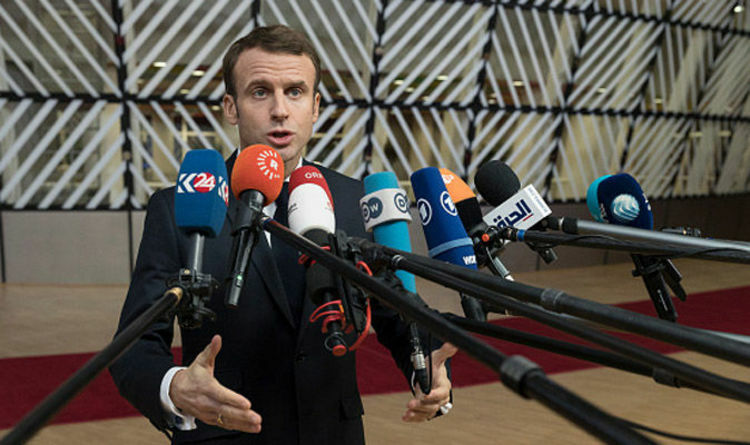 Mr Macron, for his part, has repeatedly pitched the vote as an open battle between nationalist demagogues who want to stop immigration and globalisation and liberal europhiles who want “more Europe” like himself. Support for nationalist leaders, such as France’s Marine Le Pen and Italy’s Matteo Salvini, has been on the rise recently, sparking fears eurosceptic parties could expand their strength in the EU parliament following the May vote. Mrs Le Pen’s far-right Rassemblement National (RN) party moved ahead of Mr Macron’s La République En Marche (LREM) for the first time in an Ifop poll of voting intentions for the elections published earlier this month. The poll showed Mr Macron’s centrist movement with 19 per cent of voting intentions compared to 20 per cent in the last poll at the end of August; while Mrs Le Pen’s RN — formerly the Front National – rose to 21 per cent from 17 per cent previously. The ballot will determine who leads the major EU institutions, including the European Commission, the bloc’s civil service, and is also important as a bellwether of sentiment among the EU’s 500 million people.